You guys ready for a real Western? I’m talking a real Western movie, with shootouts and adventure. And some racist portrayals of Native Americans, sure. 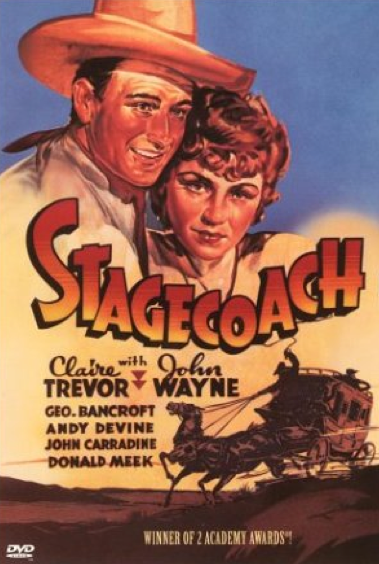 But the inherent state of being a Western means that Stagecoach is an imperfect strain of awesome. The gist: This is a road movie if I’ve ever seen one. A motley crew of passengers hop aboard a stagecoach (apparently the Greyhound buses of their day), including the prostitute Dallas who’s being run out of town. There’s also the alcohol-dependent doctor, a pristine captain’s wife, the whiskey salesman who just wants to get to his familty, a gracious gambler, and a tightwad banker. Great set of folks, right? Along the way, they run into the wanted Ringo Kid (played by a young and surprisingly fluid John Wayne). Naturally, since a sheriff is on the coach for protection, he books up the Kid. But they’re childhood friends, so there’s a little weirdness there. But none of it matters when the soldiers supposed to be protecting them take off. Now this motley crew has to get all the way to their hub town without escorts, even though roving bands of Native Americans are looting the area dry. What I “learned”: This movie takes all the tropes of a genre film and makes them wonderfully complicated. It’s hard, but that’s how you make a classic movie. You have to be willing to play with tropes. There are probably many great Western movies I’ll never see in my life. I’d certainly like to see more as part of this Challenge. But this one is wonderful because it complicates characters within their tropes. Sure, the doctor’s a drunk. but he also treats Dallas like a lady. He sobers up when he’s needed as a doctor, and is the only one with enough guts to look violent outlaws in the eye. No wonder that actor won an Academy Award. That character is complicated in a way that he certainly didn’t need to be. But it makes everything better. It makes everything so much better. See this movie if you like: Movies within a genre that complicate the narrative somewhat. The whore-with-a-heart-of-gold trope is strong with this one. But Dallas is a sympathetic character from the very beginning, and the morally upright jerks running her out of town are shown as jerks from the beginning. And our hero John Wayne falls for her with a Bus Stop-esque attitude of, “I don’t need to know everything, baby.” The drunk doctor also isn’t completely useless, and the bumbling driver turns out to be completely devoted to his Mexican wife. There’s some complicated characters in this setup! Avoid this movie if: You’re not a fan of Westerns in general, and get bored of the cowboys-versus-Indians theme in general. It’s not nearly as tiresome as The Searchers, and isn’t nearly as racist. But the legitimate complaints about those types of movies still hold strong.